Will You Get This Stealthy Black Magic Mouse Wannabe At $69? Did you ever wish Apple made a black Magic Mouse? 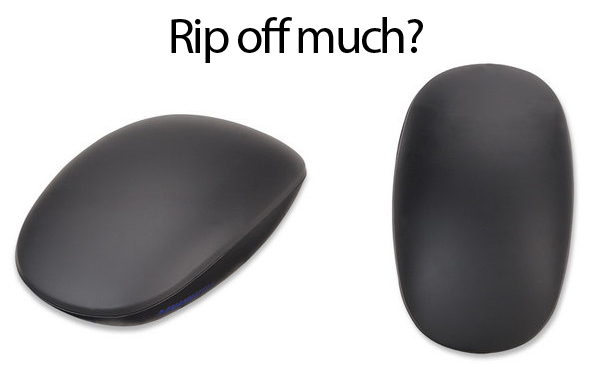 At last, now's your chance to score Manhattan's Stealth Touch Mouse, the stealthy Magic Mouse look-alike that boasts an all-touch sensitive curved surface with no buttons or clicking required. That's right, this is a true touch mouse. The Stealth Touch Mouse can be used as a normal touch mouse and can also serve as a PowerPoint presenter device. It runs off of two AAA batteries and features 2.4Ghz wireless connectivity via a tiny USB receiver, finger gestures that are said to work just like its glossy white rival. Manhattan's rubbery looking Stealth Touch Mouse is compatible with both PC and Mac for $69. On a side note, for an extra $40, you could completely customize the color of a Magic Mouse using ColorWare.